Minimize downtime with an innovative, wear-resistant solution to patching holes worn through equipment. MagPatch consists of a ceramic magnet molded within high-tensile, wear-resistant vulcanized rubber and feature a durable handle for easy placement, and removal. Operational emergencies often occur in the event of equipment leakage that involve holes in chutes, hoppers, tanks, pipes, launders and other equipment or damage to crucial applications. MagPatch is a simple yet effective solution for quick temporary repairs. When equipment wears through, simply attach a MagPatch over the hole for an instant fix. Stopping spillage has now become easier than ever with no organizational hassle and more importantly, no production downtime. MagPatch is lightweight and manufactured in a variety of sizes for flat and curved equipment. 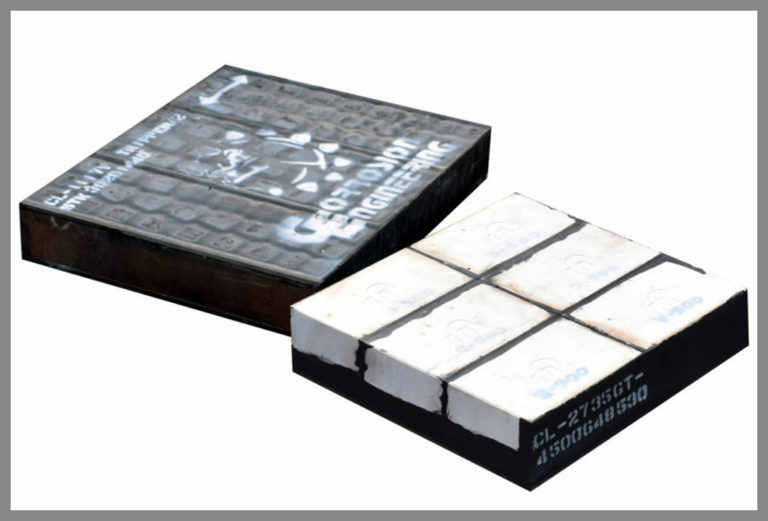 Magnetic wear patches can be furnished with CorroCeramics to produce the best results where material flow is particularly abrasive and impact conditions are moderate to high. We stock a range of MagPatches so that we can offer extremely fast delivery in the event of an emergency. Extremely high-quality rubber combined with high strength magnets provide optimal wear resistance and magnetic force to seal damaged equipment, and prevent material from escaping.